The Challenging Star Darshan is one among the most popular stars in Sandalwood and his fan base is huge to say the very least. His fans are really crazy about him and his great gesture is truly an inspiration for all. Recently Darshan Video Call to fan Revanth, who is suffering from cancer and wished his speedy recovery and subsequent assurance to provide medical help for his cancer treatment brought cheer to the young admirer. Shivamogga-native Revanth (20) is a die-hard fan of Darshan. Each year, Revanth visits Bengaluru and personally conveys birthday wishes to his idol. However, lately Revanth was diagnosed with bone cancer and his confined to the bed. On Friday, Revanth received a video call from the actor himself, who sought to reassure the young fan. He told Revanth that he will meet him after completing his shooting engagements. Revanth is known to keep track of Darshan‘s films and social engagements through his Facebook posts. Revanth’s Facebook posts are looked forward to by scores of Darshan fans as an authentic source of news on the actor. In one of his posts, the terminally-ill Revanth mentioned that it is his last wish to meet actor Darshan in person. Following the FB post, the actor himself called Revanth through his contact in Shivamogga. 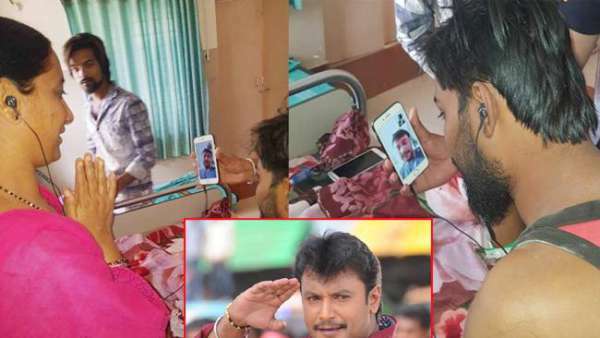 The post Challenging Star Darshan Video Call to Fan who Suffering From Cancer appeared first on SouthColors.